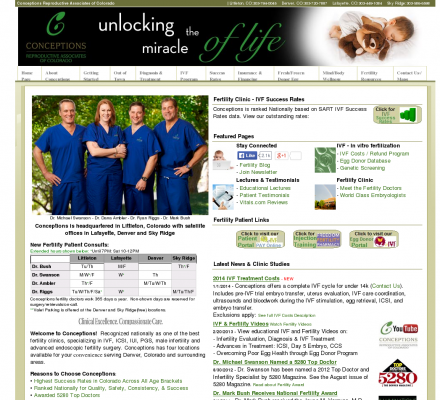 Colorado IVF & Fertility Clinic with two locations near Denver providing services for in vitro fertilization (IVF), GIFT, ZIFT, TET, ICSI, infertility clinics, donor egg and surrogacy services, infertility legal services, pharmacies, sperm banks, infertility subject matter experts, infertility research, infertility diagnosis and treatment, male factor, endometriosis, IUI, ICSI, HSG, FSH, Tubal Reversal, PCOS, Progesterone, Sperm Count, Ovulation, infertility Internet newsgroups, infertility psychological and social issues, infertility drugs and medications, such as Pergonal, Clomid, adoption, resolve, and surrogate mothers. Description: Colorado IVF & Fertility Clinic with two locations near Denver providing services for in vitro fertilization (IVF), GIFT, ZIFT, TET, ICSI, infertility clinics, donor egg and surrogacy services, infertility legal services, pharmacies, sperm banks, infertility subject matter experts, infertility research, infertility diagnosis and treatment, male factor, endometriosis, IUI, ICSI, HSG, FSH, Tubal Reversal, PCOS, Progesterone, Sperm Count, Ovulation, infertility Internet newsgroups, infertility psychological and social issues, infertility drugs and medications, such as Pergonal, Clomid, adoption, resolve, and surrogate mothers. Repromed - Reproductive Medicine Unit (Popularity: ): Infertility centre linked to the University of Adelaide in southern Australia. Center of reproductive medicine - Embrio (Popularity: ): Located in Riga, Latvia, provides advanced infertility therapy including IVF, egg donation, ICSI and surrogacy.